Making the control buttons vertical really helps save space I think. There are still random bugs coming and going with the nightlies that effect layout. I'll be able to provide more exposition on the styling of it with some variations when it all settles down. Well, they've gone and simplified the structure of the item entries... which is nice, but it makes the vertical control buttons take up more space. Back to the drawing board! I would also really love to kill off all of the individual restart buttons and replace them with a global restart via XBL, but i'm not sure if that is possible considering that restart is linked to the addon installer. The following code will work inside of a theme. It's not an override style for the default theme, although it could be turned into one with some modifications. Who knows if AMO will change their styling when the new version rolls out, but this is kinda fun for now! Last edited by patrickjdempsey on October 30th, 2010, 1:04 am, edited 2 times in total. 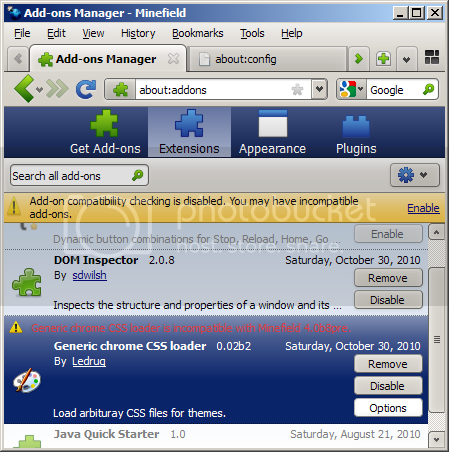 I have greatly simplified the AOM as I want it to look as similar to the old addons manager in 3.x as possible. I also wanted the background to match the addons.mozilla.org style in the details panels. 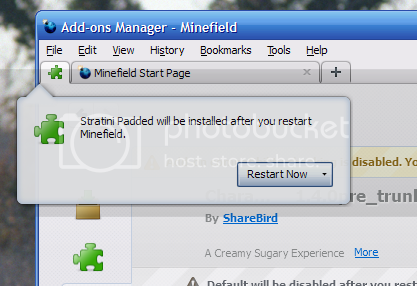 I'm listing here exactly the code I'm using in Stratini Padded, so some of the styling may not fit into your theme. Of course things like colors and background images will need to be changed for your themes. I've tried to include as many notes as possible to explain what I'm doing and why. In some cases you may want to revive certain things I've omitted per your personal tastes. I've also cleaned out stuff that was lingering from earlier hacks. If you are still using the older hacks in this thread you will need to do so as well. 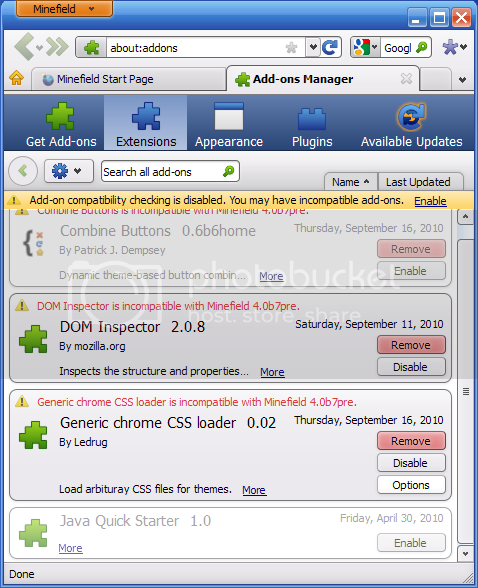 Can this be done via userChrome.css? Or do we need to use some special theme once 4.0 goes final? I would much prefer the 1st option as it would allow me to use pretty much any compatible theme. But especially the large font is what bothers me about the new AM. Patrik, how to use these styles ? ... with 'stylish' extension ? And never the less, would you make it like a single SM\FF extension ? It would be great! 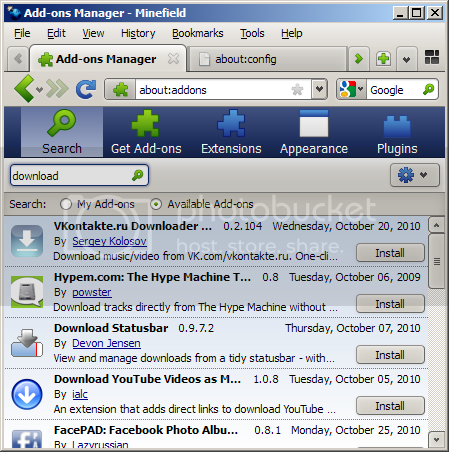 I suppose there are many people on Gecko who doesn't like new addons manager view . T0morrow and D55, these latest and greatest versions are for internal use in Themes. (Thus being in the Theme Development category). 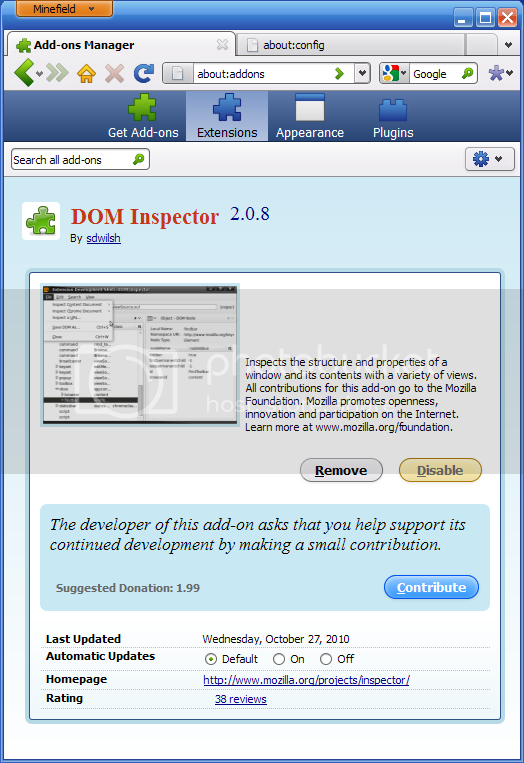 They can be converted for use in a userStyle by adding prodigious !important tags.... but things like font-size will be screwed up and there are probably many places where the default theme styling will still come through. You can see the first iteration at the top of the thread for examples of how to resize the fonts, although I think many of the element names have changed since then. I might get around to building a userStyle for it but probably not any time soon. If anyone has ambitions of building a userStyle around this, please feel free... I'm posting this work for everyone. Is there a way to make the downloading/installing progressmeter for an add-on appear on demand, like when you're updating? It would be nice if you could turn it on and leave it on while you're styling it. Also - is the pause button supposed to work? It doesn't seem to. You can go in DOMi to the class "install-status". In DOM Node you see the "hidden true". Double click it and change it to false. The progressmeter should appear. When you go down the tree to .progress you can give it also in DOM Node with "Insert" a "value 50". Now the progressmeter has a progress of 50%. @mcdavis.... something is broken with these progress meter things... I've had a really difficult time getting them to do anything resembling what I tell them to do... maybe one of my other styles is interfering but I stopped working on them because they were just so frustrating. @Paenglab, thank you for that... should make it easier to figure out what's really going on with these things! thanks guys. paenglab, your suggestion is working great. we'll see how the rest of it goes ... i may end up having to rework my basic toolkit progressmeter element as part of this. 1. It makes navigation between non-UI tabs and UI-tabs confusing and jumpy... no thanks. 2. It creates a totally different UI behavior for tabs-on-top and tabs-on-bottom... and that is simply NOT acceptable IMO. 3. It breaks all of those new notifiers and such... what is the point of these weird new behaviors if they are only seen in one configuration but not another?? So now there is just a floating "arrow panel" that doesn't really point to anything? Huh? 4. It means I would have to create a whole new rule set to deal with tabs in this mode, no thanks my tabs are already TOO complicated as it is. patrickjdempsey wrote: 3. It breaks all of those new notifiers and such... what is the point of these weird new behaviors if they are only seen in one configuration but not another?? So now there is just a floating "arrow panel" that doesn't really point to anything? Are you saying that if you get an arrow panel notification while AOM is hiding toolbars, the arrow panel is still pointing to the hidden toolbar? mcdavis wrote: Are you saying that if you get an arrow panel notification while AOM is hiding toolbars, the arrow panel is still pointing to the hidden toolbar? Install your theme by dragging it into the AOM to test for yourself.